It's a polygon script to create polygon object with mirror option. target: set copy target. polygon object, folder, or smart folder will be allowed. attach materials: by clicking attach button, all materials of target will be attached automatically. 20170724: wrong file uploaded, fixed. update button and timer parameter added. 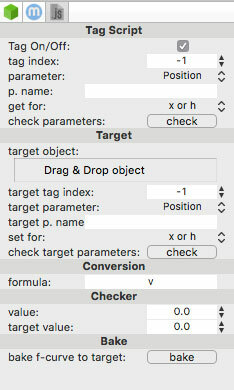 It's a tag script to control other object's parameter by object's parameter that attached to. it's available for Cheetah3D v7+. 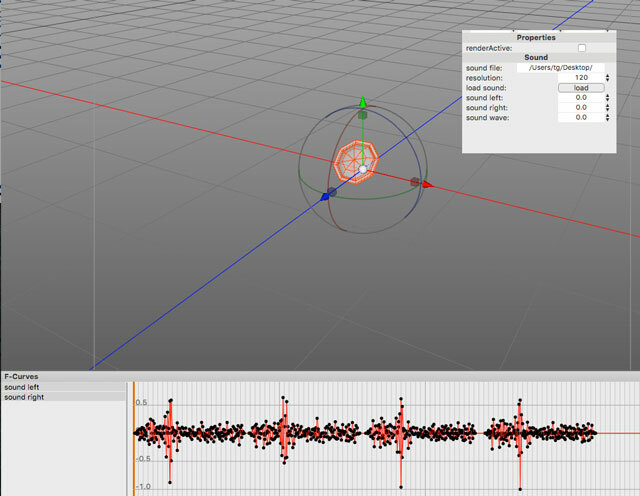 It's a polygon script to load sound file ( .mp3 / .aiff / .mov / .wav . etc. ) as f-curve data. [update] 20170401: file path escape bug fixed. [update] 20181119: max keycount bug fixed. It's a tool script to destroy polygon object. only Cheetah3D v.7+. It's a tool script to slice polygon object. only Cheetah3D v7+. It's a Tool script to cut polygon object with spline path. only Cheetah3D v7+. It's a particle script and helper binary program file, place these 2 files into ~/Library/Application Support/Cheetah3D/Scripts/Particle folder to install. This script makes particle grid with color information from image file.